I love the sentiment expressed in this postcard from 1914. It does seem like we cram a lot of holiday fun and excitement into the last week of the year. Wouldn't it be better to spread some of that fun throughout the rest of the year? "I can't understand why it's only a week from Christmas to Happy New year when three hundred and sixty days must go by before Christmas again will appear!" 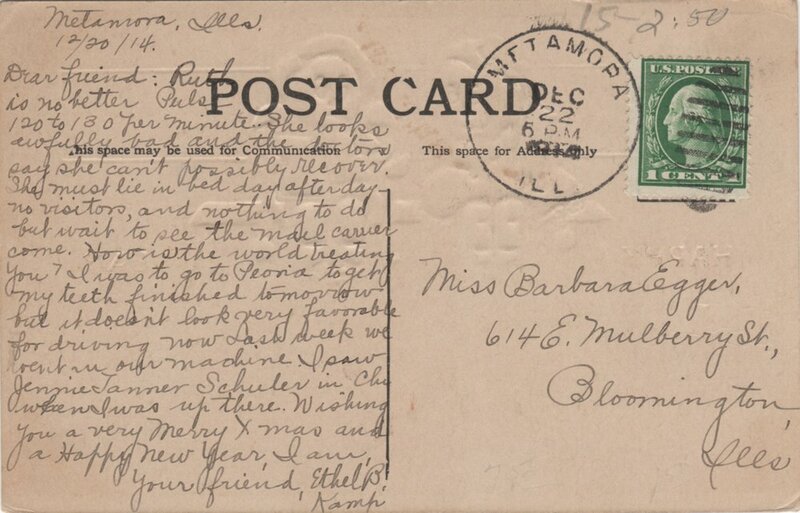 This postcard is dated December 20, 1914. It was sent from Metamora, Illinois. It was addressed to a Miss Barbara Eggen at 614 E. Mulberry St. in Bloomington, Illinois. Who was Barbara Eggen in Bloomington, Ill in 1914? Was "Ruth" a friend or a family member? What is medically wrong with Ruth? Does "our machine" refer to a car? Who is Jennie Tanner Schuler and what is she doing in Chicago? I would love if any of my blog readers could look into some of this information and help us all lear more of the story. Let me know what you can find! You can see some of the other postcards I've posted here. Happy New Year to you all. I am really looking forward to 2018! I hope you are too.